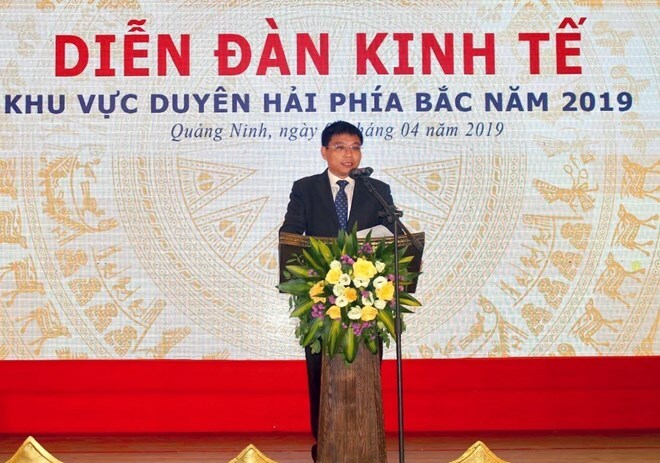 Quang Ninh (VNA) – An economic forum gathering northern coastal localities and their neighbours was held in Quang Ninh province on April 2, aiming to enhance the region’s connectivity in economic development and business climate improvement. The event in Uong Bi city drew officials from coastal Hai Phong city, the coastal provinces of Quang Ninh and Thai Binh, along with the nearby provinces of Hai Duong and Hung Yen. Addressing the forum, Vice Chairman of the Quang Ninh People’s Committee Nguyen Van Thang said his province aims to turn services and industry into the main parts of the local economy, while becoming a high-quality tourism hub of the northern region in 2020. To that end, Quang Ninh has taken bold actions to restructure its economy, reform the growth model, and switch from the brown (coal-based) to green (environment-based) development approach so as to make breakthroughs in the field. Sharing local experiences, Thang noted that Quang Ninh has built a synchronous system of overall plans with the participation of the world’s leading consulting firms. It has worked to remove infrastructure bottlenecks by developing hard infrastructure like expressways, an international airport and seaports, as well as soft infrastructure such as promoting e-government and utilising software for administrative procedures. The province has also diversified forms of investment and asked the Government for permission to mobilise legal capital sources for key projects, especially transport infrastructure facilities, he added. As a result, more than 36 trillion VND (1.5 billion USD), three-quarters of which is from private sources, has been attracted for the building of transport facilities since 2015, the official said, noting that several big facilities were put into use last year, including the Ha Long-Hai Phong Expressway, Bach Dang Bridge, Ha Long-Van Don Expressway, Van Don International Airport, and Ha Long International Cruise Port. At the forum, a Hai Phong official also shared the city’s experience in socio-economic development and its efforts to become a major centre for navigation and maritime transport services in Vietnam. He said provincial authorities have focused on measures to improve the business environment and improve the competitiveness. Since 2016, Hai Phong has worked with the Vietnam Chamber of Commerce and Industry to foster a favourable business climate by streamlining administrative procedures, cutting down the time needed for procedure settlement and customs clearance, and stepping up online public service provision.